UCSD TV recently posted this video from an "Innovation Crossroads" event co-presented by CONNECT and UC San Diego Extension. The event is moderated by James Fallows. Key to San Diego's economy and identity are the aerospace and communications sectors, creating markets from drones to next-generation wireless communications. Explore the visionary technology igniting these industries and the implications this growth has to further propel San Diego as a leading global city. Featuring nationally celebrated journalist James Fallows of The Atlantic magazine and executives from global technology leaders ViaSat, Solar Turbines and the Center for the Advancement of Science in Space (CASIS). The University of California, San Diego Jacobs School of Engineering will take part in an international collaboration with the Korea Advanced Institute of Science and Technology (KAIST) on precision medicine based on new technology. The Memorandum of Understanding was signed on March 14 at the U.S.A-Korea Joint Symposium on N/MEMS and Bioengineering. Jacobs School of Engineering Dean Albert P. Pisano gave the welcome at the event, which included presentations by Gordon Hoople, a PhD candidate in Pisano’s lab, and Kun Zhang, a professor in the Department of Bioengineering. The objective of the collaboration is to establish a long-term fruitful platform for bilateral cooperation by means of joint research and education programs, technical information and research exchange programs between two parties. For International Women's Day, Coursera asked two UC San Diego female teaching professors for their thoughts on Women in Tech. Mia Minnes and Christina Alvarado co-teach "Mastering the Software Engineering Interview" with teaching professor Leo Porter on Coursera. In high school when I took my first real computer science class, I discovered that computer science was intriguing and challenging. For me, solving concrete problems was just plain fun. I was hooked. At the heart of the tech industry, there’s a broad cultural change that needs to happen. It’s not about just pushing more women into computer classes or STEM disciplines from a young age. Women are still entering higher education and are confronted with barriers in a learning environment dominated by male students and instructors and later on, in the industry. We need to address the cultural issues and biases that are at the root of gender diversity, to make women feel that they are accepted and belong in computer science and the tech industry. The more people who acknowledge these biases publicly, from educational institutions to technology companies, the more we all will be able to confront this problem and work together to change it. Being a role model is something I take very seriously, and it’s something that my own experiences as a student in college have helped shape. As an undergraduate, I remember the jolt of realizing, almost every time I stepped into a lab or a lecture hall, that I was the only woman in the room or one of very few women. Anyone embarking on a challenging field or project can benefit from having someone that they can relate to and look up to. I think it’s especially important to be able to see others who you can identify with and who have gone before you and succeeded. Many of the women who attend my office hours have told me this is the first time they’ve ever felt comfortable approaching one of their professors, not to mention participating in office hours. I think that’s very telling of just how crucial it is to have networks of women – both in the workplace and in education. They are essential to supporting them and further setting them on the path to succeed in the technology industry and their future career paths. I agree with many who will tell you that mentorship isn’t the only solution, but I think it’s an important factor in empowering women to pursue their passions and follow their curiosity, whether it be in technology or any other field. When he’s not surfing in Mexico or listening to electronic music, Dave Nelles is busy tinkering – inside living cells! Growing up, Nelles always knew he wanted to develop technology, but was intrigued by the complexity and diversity of processes in biology. Motivated by this gap, Nelles focused his graduate work in materials science and engineering on technologies to measure and alter a fundamental biological molecule: RNA. Inside cells, DNA is transcribed into messenger RNA (mRNA), which is subsequently translated into protein. Proteins are the building blocks of life – many functions that take place inside of a cell are made possible by proteins. “In many diseases, the processing of mRNA is dysfunctional, meaning that the protein that is encoded for by that RNA will not be made correctly, or at all,” said Nelles. In molecular biology, there’s a technique called CRISPR-Cas9 that is used to modify DNA and has the potential to cure a range of genetic diseases. Nelles and his collaborators have been able to demonstrate that CRISPR-Cas9 can not only bind to DNA, but also to RNA. This approach is described in a paper published on March 17th in the journal Cell. In collaboration with Mitchell O’Connell in the lab of Jennifer Doudna at the University of California, Berkeley, Nelles tagged Cas9 with a fluorescent protein and targeted various RNAs to track their movement inside living cells. Stress granules are accumulations of RNA and protein in a cell and their formation has been linked to neurodegenerative diseases. Nelles and his team hope that providing a way to track these RNAs will assist with new drug development. After graduating this Spring, Nelles will be continuing his work as a postdoc at UC San Diego. Want to learn more about other projects at the Jacobs School? Register to attend Research Expo on April 14, 2016. Remember the first time you geeked out over something? It might have been technology, or cooking, or a book--it doesn't matter. That's the feeling Jacobs School alumna Jennifer Arguello is trying to spark in a new generation of computer scientists. She is especially focused on under-represented students, such as people of color and women. Arguello, who is now the senior technical development manager at GitHub, gave a talk at an event for the SheCodes organization. It is now featured on the Smithsonian's Latino Virtual Museum. Argüello is part of the Silicon Valley Latino advisory board, an organization “committed to celebrate the stories of successful Latinas and Latinos, to challenge perceptions and inspire new generations of Latino heroes”. During her talk, she urged her audience to volunteer, enlist their company for support, become mentors and advocate for computer standards across the board in elementary, middle and high school. "Find your inner boy geek or girl geek and allow them to play," she said. Amay Bandodkar, a Ph.D. student in the lab of nanoengineering professor and chair Joseph Wang, has won the 2016 Young Chemist Award from Metrohm USA, which comes with a $10,000 prize. Amay’s research focuses on developing next generation of wearable sensors that, unlike today’s wearable devices, possess the power to continuously monitor physiologically relevant chemicals directly on the human body in a completely non-invasive fashion. He is developing specially engineered printable inks for fabricating smart printed devices that can be easily stretched and self-heal when mechanically damaged. These inks are then used to develop non-invasive wearable electrochemical devices for various healthcare applications. The work has been covered by ABC News, the Huffington Post, Yahoo News and Popular Science, among many other news outlets. Meet Aichen (Claire). 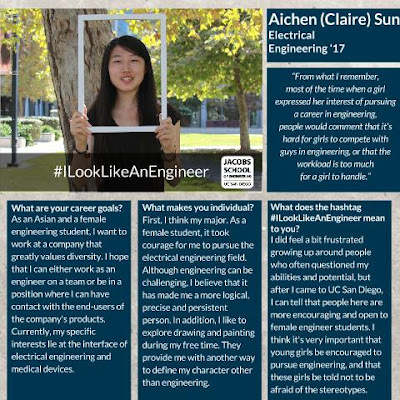 Outside of painting in her free time and serving as secretary for UCSD’s HKN - one of only two females on board - she applies her electrical engineering knowledge to the medical device field. Before I came to UC San Diego, I wasn't completely sure about what major I wanted, but I knew what subjects I was better at and enjoyed more - math and science. I didn't grew up in a family of engineers. Actually,I was always been told that a girl like me should work on improving my communication and writing skills. Even though I enjoyed math and science, I was confused about their real-life applications. I was first exposed to engineering during high school and was fascinated by how engineers can utilize knowledge of math and science to design products that benefit people’s lives. I chose UC San Diego for several reasons. First of all, it has a very good engineering program. More importantly, it contains a large body of engineering students that includes many female engineering students just like me. It shows how much the school values diversity. As an Asian and a female engineering student, I want to work at a company that greatly values diversity. I hope that I can either work as an engineer on a team or be in a position where I can have contact with the end-users of the company's products. Currently, my specific interests lie at the interface of electrical engineering and medical devices. "Fake it ‘till you become it" and "Live life to the fullest." What are three things that make you your own individual? First, I think my major. As a female student, it took courage for me to pursue the electrical engineering field. Although engineering can be challenging, I believe that it has made me a more logical, precise and persistent person. Second, I like to explore drawing and painting during my free time. They provide me with another way to define my character other than engineering. Third, I went to school early, so I grew up with almost all older classmates. I think it's a unique experience, and it has made my mentality more mature than many other people my age. During my schooling in China, I felt like people were less open to girls who are interested in the engineering field. From what I remember, most of the time when a girl expressed her interest of pursuing a career in engineering, people would comment that it's hard for girls to compete with guys in engineering, or that the workload is too much for a girl to handle. On the contrary, when a boy expressed his interest in pursuing an engineering degree, people complimented him and said something like "oh you are going to make good money". I did feel a bit frustrated growing up around people who often questioned my abilities and potential, but after I came to UC San Diego, I can tell that people here are a lot more encouraging and open to female engineer students. I think it's very important that young girls be encouraged to pursue engineering, and that these girls be told not to be afraid of the stereotypes. Regarding diversity, I did not truly realize its importance until I took a course on managing diverse teams this summer. The professor who taught the course shared some really interesting experiences she’d had. I was amazed by her stories about teams succeeding through the use of the inherent characteristics of each team member, such as race and gender. Every element has its own potential and should be greatly valued. Last summer, computer scientists at the Jacobs School demonstrated that they could wirelessly control thousands of vehicles via a gadget that's often used by insurance companies to monitor cars. The team, led by Professor Stefan Savage, has worked to raise awareness of flaws in the cybersecurity of cars since 2010. The FBI and NHTSA are warning the general public and manufacturers – of vehicles, vehicle components, and aftermarket devices – to maintain awareness of potential issues and cybersecurity threats related to connected vehicle technologies in modern vehicles. The agency recommends that vehicle owners check the safercar.gov website twice a year for recalls on their cars. Born and raised in Italy, UC San Diego structural engineering graduate student Elide Pantoli knew she wanted to help people, but also knew didn’t want to be a doctor. Pantoli chose to study civil engineering at the University of Bologna – the oldest university in the world. She knew she wanted to study abroad, and the university offered an exchange program with the University of California school system. From there, Pantoli returned to start her Ph.D. at UC San Diego in 2010. She started working on the Large High Performance Outdoor Shake Table (LHPOST) at UC San Diego – the largest outdoor shake table in the world – which provides the earthquake engineering community with a facility that allows the accurate reproduction of severe earthquake ground motions for the seismic testing of very large structures. Pantoli tested a full-scale five-story building fully outfitted with nonstructural components. Her dissertation focuses on one of these – the precast concrete façade. This is what she will present at Research Expo 2016 (see abstract below). Pantoli is interested in both industry and academia – but her dream is to change engineering education. “I’ve seen students in their third year that are so frustrated because they still don’t know what they are doing,” said Pantoli. She is passionate about helping students master a subject. Register today for Research Expo 2016 to hear more from Pantoli and 200+ engineering graduate students for the Jacobs School of Engineering. Research Expo also features TED-style talks by faculty highlighting research from our agile research centers and a networking reception with faculty, students, industry partners and alumni. Architectural precast concrete (APC) cladding is a nonstructural system sensitive to both seismic floor accelerations and story drifts. APC panels must be designed to resist forces in the out-of-plane direction of motion, while they must accommodate in-plane story drifts. This requirement presents specific challenges to engineers, namely the design and detailing of connections intended to allow in-plane drifts (termed ?tiebacks?) and corners of the system. Presently, these important issues are addressed rather broadly in design codes, leaving the details to the discretion and experience of the designer. With the goal of providing practical guidance to designers, system and component tests on representative APC cladding and tieback connections were performed. This poster summarizes key results obtained from these experiments and applies these findings to develop guidelines for drift-compatible design of tieback connections and corner systems.